Abstract. We provide a complete classification of the critical sets and their images for quadratic maps of the real plane. 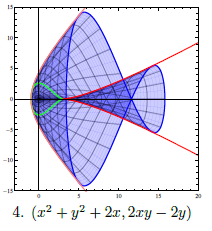 Critical sets are always conic sections, which provides a starting point for the classification. The generic cases, maps whose critical sets are either ellipses or hyperbolas, was published by Delgado et al. in 2013. This work completes the classification by including all the nongeneric cases: the empty set, a single point, a single line, a parabola, two parallel lines, two intersecting lines, or the whole plane. We describe all possible images for each critical set case and illustrate the geometry of representative maps for each case.